Halloween was never really considered a fun Holiday once I passed the trick or treating age, but then The Kid came along and it was a whole 'nother story... I started getting those pumpkin carving kits and then I started doing them on my own when I was in culinary school, my front porch always had at least 3 or 4 wicked pumpkins adorning it. When I moved to this place being sort of front porch-less I stopped carving pumpkins (because you can't really see the pumpkin sitting on the side stoop, now can ya?) But this year The Kid almost begged me to get a pumpkin "Come on Mom, Pleeeeeeeeeeease?" So on Saturday we went over to Home Depot (which is the only place around that still had any pumpkins worth carving and half price too!) and picked up this Ginormous pumpkin (it had to be around 25 pounds). Yesterday afternoon we took the pumpkin outside and The kid had a little too much fun scooping the 'Guts' out (and throwing them at me, mind you) we saved the pumpkin seeds to maybe try and plant a few to see if we can grow our own pumpkin for next year and roast a few then we planned our mission, to carve a 'really cool' pumpkin with little help from mom, so we did a little pencil drawing and I gave The Kid my set of kid friendly pumpkin carving tools and he was on his way to becoming a carving master. 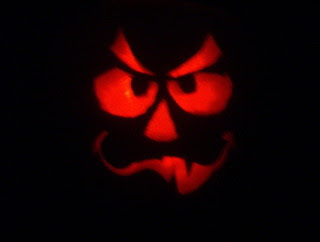 The Result.. . an Awesomely wicked pumpkin that looked downright evil with the right lighting.. He's still pretty Wicked though.